The photo above, sent out via various social media outlets yesterday by the Dodger PR department, looks innocent enough, but it has been the fuel to a growing controversy with Latino Dodger fans. 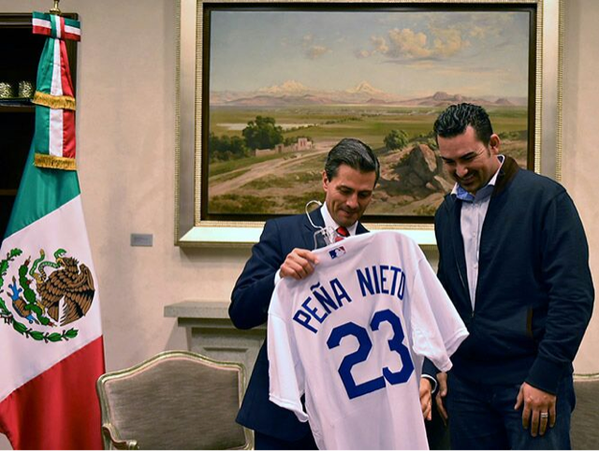 Featured is Dodger first baseman Adrian Gonzalez with Mexican President Enrique Peña Nieto. The Dodgers gave Nieto his own personalized Dodger uniform. As you may know, Mexico has been embroiled in a political/societal uproar involving the kidnapping and murder of 43 student teachers in Guerrero that has reportedly implicated everyone from the cartel to a mayor to police officers. Protest, marches and riots have been stewing throughout the country for the past couple of months and it looks like it is far from dying down. The President of Mexico, as you can imagine, has been the subject of much criticism. So much so, there have been calls for his ouster. So, imagine what a Dodger fan with a keen eye towards Mexico thought when the above photo was released. There was understandable outrage, and soon enough fans and observers alike flooded every outlet possible to voice their anger. @Dodgers @AdrianTitan23 @EPN this is absurd! 😠 that president doesn't deserve a Dodgers jersey!! @ThinkMexican @Dodgers it started with Chavez Ravine...and you still haven't learned. Sin vergüenza! It is safe to say that we expect even more negative reaction today before the Dodgers respond—if they even respond. Several questions come to mind: who thought it was a good idea to customize a jersey for Peña Nieto, given all the recent events surrounding Ayotzinapa? Is Gónzalez not aware of the situation? If he is, did he stay silent about it? And are the Dodgers even aware that a significant portion of its fan base is very aware of the situation in Mexico? This one hurts for a lot of people. The Dodgers should do the right thing and address this social media fail with honesty and true understanding. Typical “we apologize if we offended anyone, it wasn’t our intent” statements won’t cut it this time. I suspect we'll hear from the Dodgers and Adrian Gonzalez soon, but in the meantime a seething anger grows with a fanbase acutely aware of its history (i.e. Chavez Ravine). As Latino Rebels states above, this wound must be addressed in some fashion, and hopefully it's more than your typical statement.